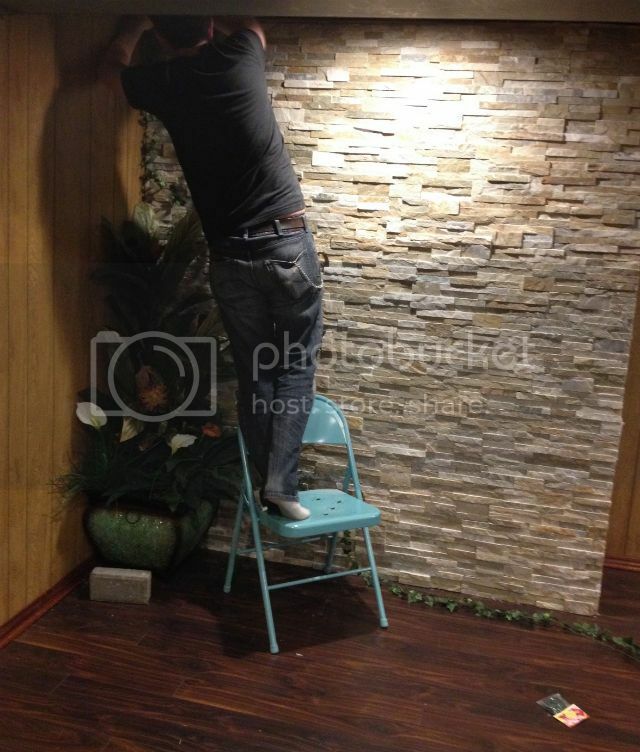 Betties N Brimstone: DIY Graceland-Style Rock Wall! Dave and I are so happy because we have finally begun to see the light at the end of the tunnel. 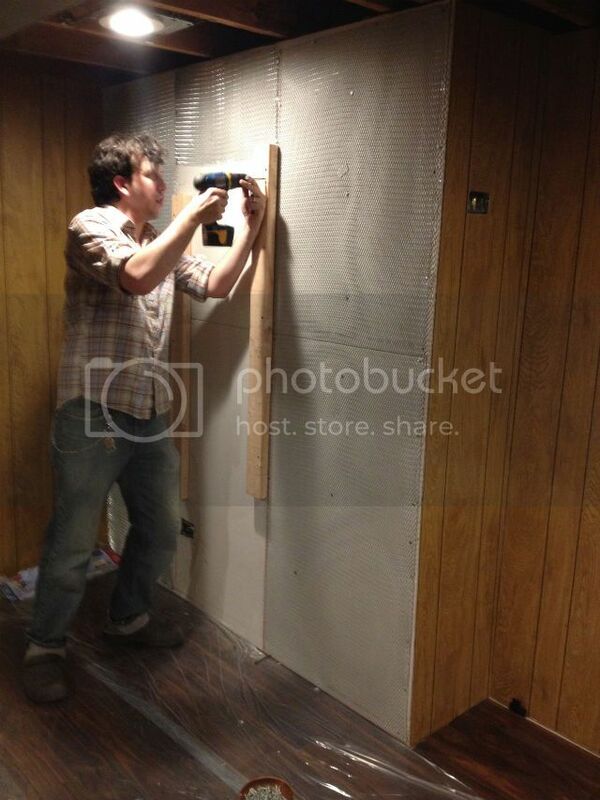 Our involuntary basement renovation is close to being finished!!! YAY! We got PermaSeal, new electrical work, put down a new floor, put up new drywall and paneling, AND... we now have our very own rock wall! Graceland style!!! If you're looking to spruce up a wall or two in your house, I recommend mortaring up a rock wall of your own! This is a few day process, but totally worth it! 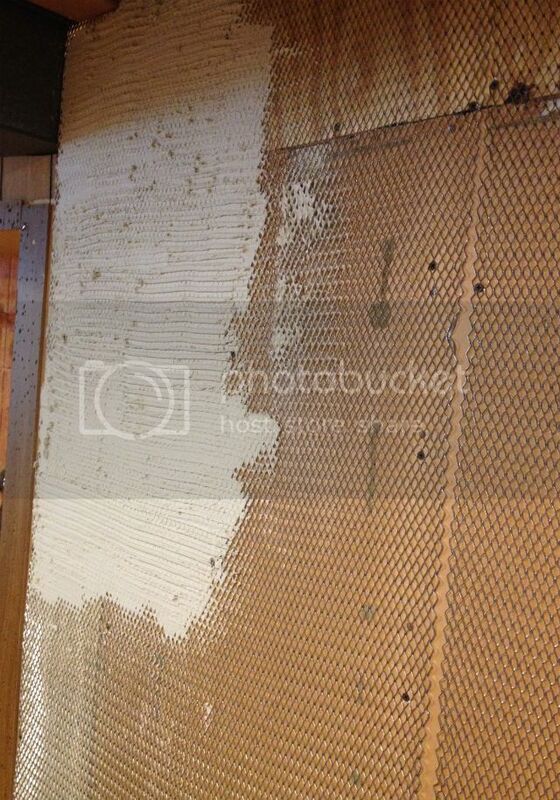 Nail up your metal lathing onto your drywall wall with nails. Once it's secure, you can begin to mortar! Cover the floor and set out your tools and one bucket with water in it to clean tools and one to mix mortar. Read the directions on the packaging in order to get it to the correct consistency. Once your mortar is mixed and ready to go, you can begin spreading your first layer of mortar on the metal lathing. We learned that it's best to work from the ground up and you will want to smooth on about a 1/2 inch of mortar over the lathing. After your wall is mortared smoothly, you will need to take the trowel with teeth and drag it along the mortar in order to create grooves. Once your mortar is dry, you can start mortaring on your rock tiles from the bottom of your wall up. You'll need to measure out your rock in order to make sure it will fit onto your wall correctly. 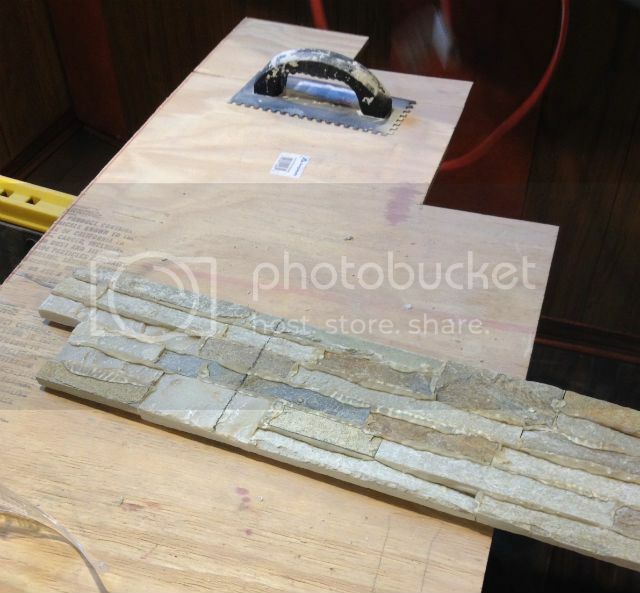 You will need to be VERY CAREFUL when cutting your rock tiles to size. This can be very dangerous, so do your homework and wear protective eye-ware and a breathing mask. 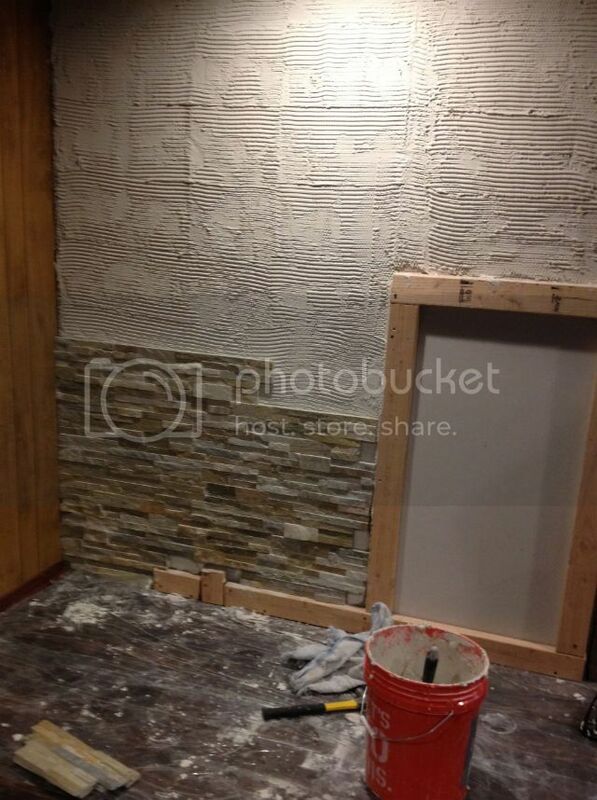 When you are ready to mortar your rock pieces onto your wall, only put up 4 or 5 full layers of rock the first day. In order to get your rocks to stick, you will need to spread about a half an inch of smooth mortar onto the rock tile and then press it against the dry mortar ridges on your wall. Repeat for five full lines from the bottom up. 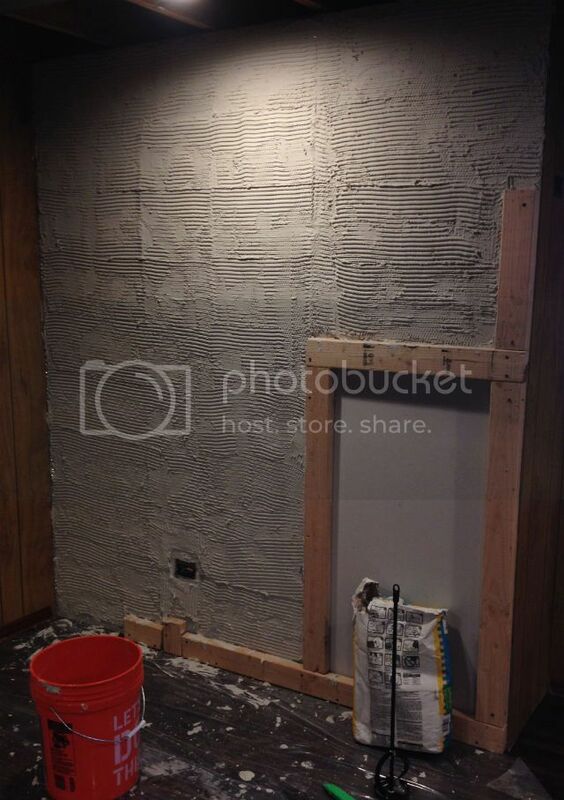 You'll need to let it dry overnight to ensure a stable foundation for the rest of your wall! 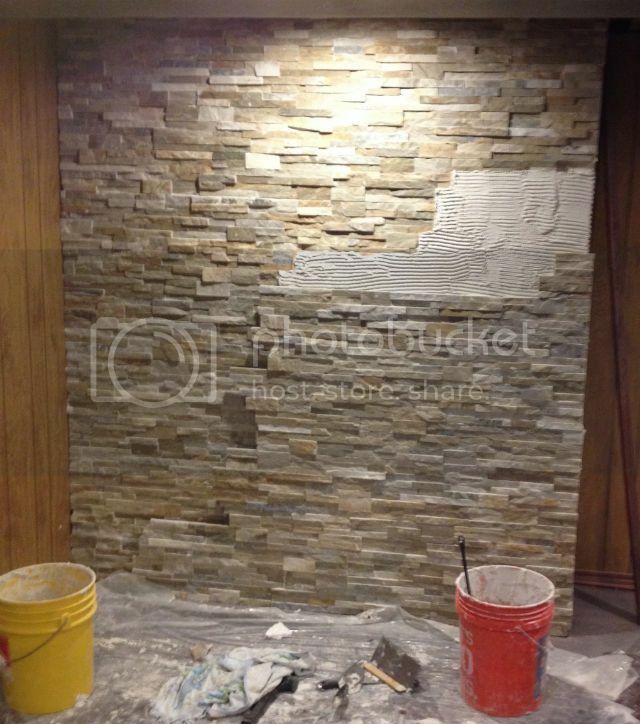 The next day (once your first few layers are dry) you can finish mortaring the rock tiles onto your wall! After your rocks are dry (more than likely, the next day) you can start to decorate your wall and put your furniture back in place! We bought a bunch of fake plants from Hobby Lobby and went all out on the Jungle Room theme! Congrats!!! You did it!!! You've got your own Graceland-style rock wall! 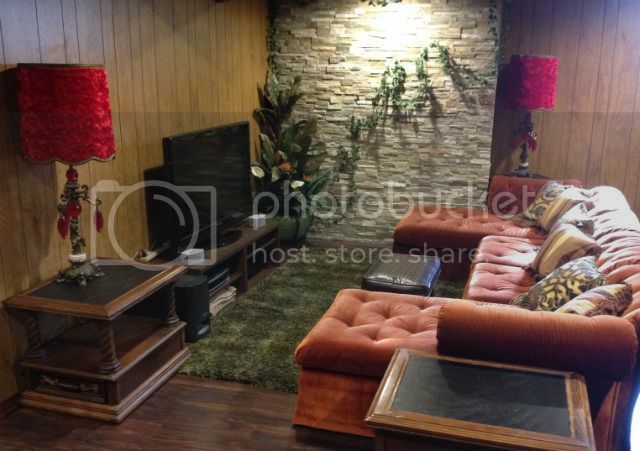 Sit back, relax and enjoy a cocktail in your brand new Jungle room!